So here we are with The Christmas Trail. 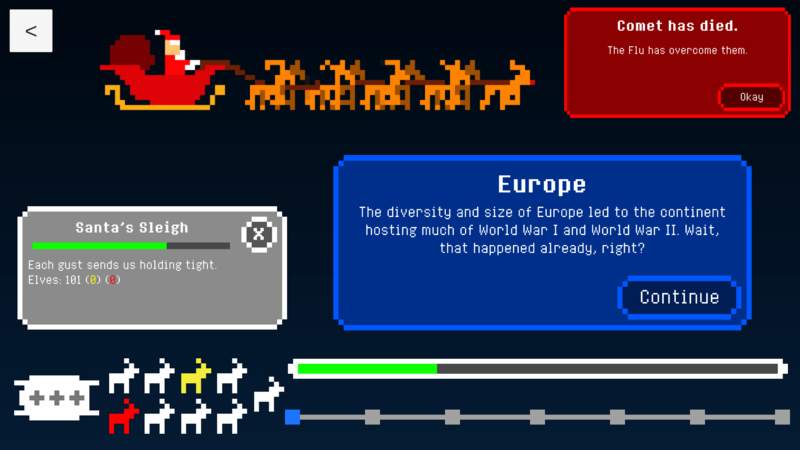 You’ll get to manage your crew of elves and reindeer through the long journey from continent to continent, delivering presents to all the good boys and girls in the world. The RNG gods will be active, determining if any of your crew comes down with an assortment of sicknesses. You’ll stop at major cities along the way, giving you time to evaluate your situation. Stock up on more cookies or carrots to feed the lot. Call in for a delivery of presents from the North Pole if you’re running low. Make sure this next leg of the journey won’t be your last! Your sleigh runs on Christmas Spirit, and you’ll want to keep a close eye on this as your do your work. When you deliver presents on time to every child, you’ll get a boost in Christmas Spirit. If you don’t, it will surely drop. If your crew gets struck with sickness (or even worse, dies), your Christmas Spirit will also go down. Do your best to keep the spirit high, because if it falls to zero, the game is over! So that’s the basics of the game idea. Things are changing day by day, so stay tuned to see what new things arise. A lot of the gameplay has already been coded, but there still a lot of work to do. With that being said, I’m gonna get back to work! Thanks for reading and I’ll see you soon! This entry was posted in Design, Devlog, Featured, Uncategorized and tagged Design, Devlog, The christmas trail. Bookmark the permalink. ← The Christmas Trail Development Has Started!